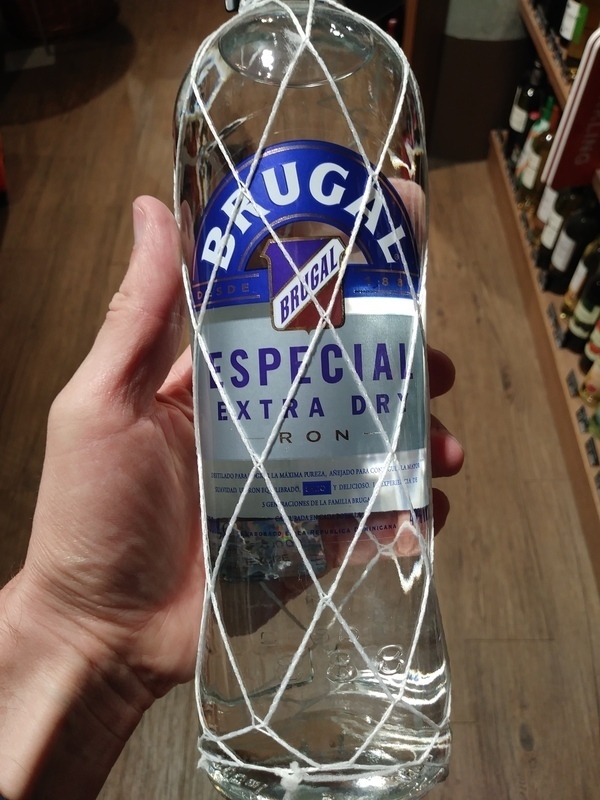 Have you found an online vendor selling Brugal Especial Extra Dry? Among the best rum forse mixing, not very expensive. Enjoyed a bottle of Brugal Especial Extra Dry while vacationing in Malta. Very boring and cheap looking bottle and label design. Pure alcohol to the nose and palate. Mix it with your favorite soda and down it goes. I must say this is a perfect rum for rum Martinis, mojitos or a rum and lemon/soda. I do enjoy a crisp taste in my cocktails and not to sweet. Not essentially a good rum for sipping but excellent for mixing do to the dry and unsweet taste. a believe its a must have in your bar for cocktail making. Sip it with a little ice and water. Blackbeard style! A'rrrrr!!!! This is my standard white rum for mixing. Not too much to say about it, i think it's the better tasting in making Daiquiris and stuff like that. It costs a little more that Havana, but in my opinion it's slightly better. In terms of basic white rums go this is as basic as it gets. White vanilla oak. The slight harshness. blhablhablahablh put it in coke and you get a basic white rum and coke with a little more sweetness. A direct upgrade from this would be Diplomatico blanco. Diplomatico blanco has a much better sweetness at the end a better body and less harshness. This joins the basic white rum club. This is a nice mojito rum. Surpasses Bacardi in my opinion. Like the Brugal X/V and Anejo I consider this rum a great one for the price. Always a nice mixed drink created with these rums. Enjoy! A really nice well put together slightly dry white mixing rum. A favorite. I use it in mixed drinks. It looks like the standard Bacardi, but softer and better of taste. This is among my favorite white rums. It's slightly aromatic with subtle flavors and fairly smooth, more complex than most other white rums. It's a great buy at this price point, around $15 US for 750 ml in Ohio . I prefer it neat or neat with a little water or chilled. The subtle flavors get lost when it's on on the rocks. Nov. 2015 Update: recently I read that this was deemed the best rum for a Mojito in a blind taste test. I tried it and I agree, although the Mojito is not among my favorite cocktails. Not for drinking straight but a good mixer, has a pot still flavor. But I am. Very clean. Almost no aftertaste. No other taste but sugar but that's ok. Mixes well too. This is an overall go to rum for the price at 24.00 for 1 Liter. This is a 7 sipper and a 10 mixer. So I give this a 8.5 overall. Anything calling for extra dry this is the number one choice. This overall is great either way. I can only hope to come come across ciglo de oro or even papa andre some day. This I hear replaced blanco which I can still get here at certain places. I have a new favorite now, but Brugal Especial is still in my cabinet. Good with Mojitos and other citrus drinks. I suppose this is ok for mixing as long as you mix it with something strong. Tasting this on it's own and it taste like rubbing alcohol. This is my favorite white rum to mix. It is so unassuming that it never gets in the way of your cocktails. Makes a wonderful Mojito.